Place quinoa in sieve and run under cold water. Add fresh water to a saucepan, add quinoa and stock cube, and cook according to package instructions. Set aside. Cut tomatoes into halves. Pick rosemary from stem and roughly chop. Remove pit and peel avocado, cut into bite-sized cubes and set aside. Add olive oil to pan over medium-high heat. Add tomatoes, rosemary, and agave syrup and cook for approx. 15 mins. or until tomatoes thicken. Stir occasionally, then set aside. For the miso sauce, add white miso paste, mustard, sesame oil, neutral plant oil, lemon juice, and water to a small bowl and mix until the texture is smooth. Season to taste with salt and pepper. Add water to a small saucepan and bring to a boil. Cook eggs for approx. 6 min., peel, then set aside. 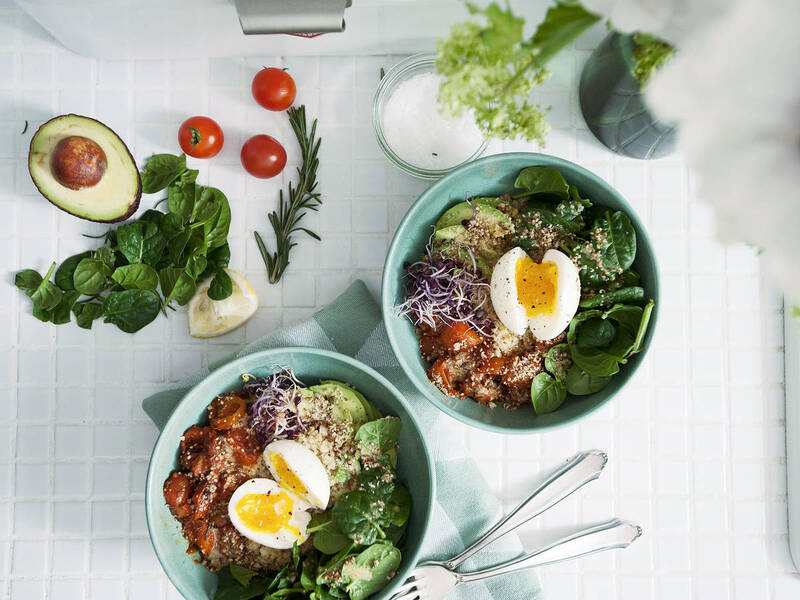 Add quinoa to a serving bowl and top with avocado cubes, cooked tomatoes, and fresh baby spinach. Place egg in the middle and finish the bowl off with some miso sauce, a sprinkle of dukkah, and beetroot sprouts. Add more salt, pepper, and lemon juice as desired and enjoy!